Today’s guest is blazing trails and changing lives. After spending 10 years growing his own business and achieving exponential growth, he got under the hood of how he actually did that. He looked at not just the moving pieces of growing a business, but who the person was that he had to become to be able to lead his team and scale his growth. He’s completely innovated the way he now coaches entrepreneurs to grow their businesses, understanding that behind all of the marketing and methodology is actually a human being, with their own limiting beliefs to overcome. You can find him spinning his genius on his own show called The Mind Your Business Podcast. He’s one part entrepreneurial maven, and one part personal development guru. 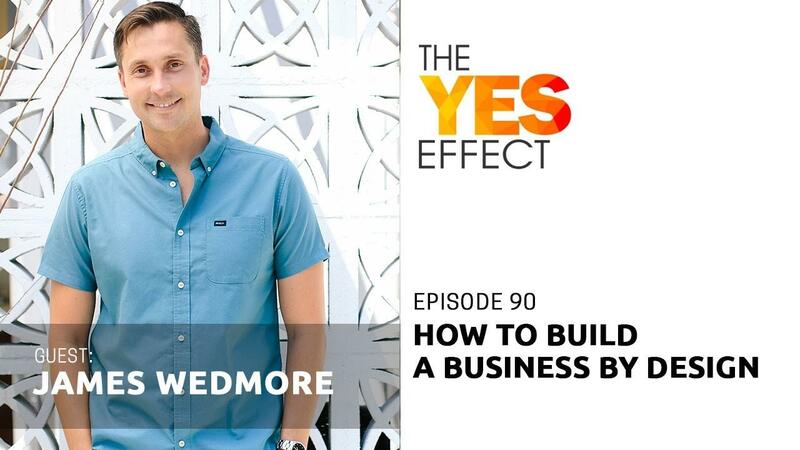 His name is James Wedmore, and this is The YES Effect Show! For the past 10 years, James Wedmore has been teaching entrepreneurs and online business owners how to leverage the power of online video and YouTube marketing to reach more people, share their message and convert more customers. In 2016, James made a massive shift to focus on a big gap missing in the marketplace: The Mindset of Entrepreneurs. Today he shows his clients how to work smarter not harder through effective processes and systems that give you back your time! He believes launches CAN be fun and easy, not stressful and overwhelming. And helps his clients exponentially grow their business by helping them break through the internal mindsets that hold them back. What James’ Business By Design course and new 8-part video series is all about!